The Royal Bafokeng Sports Palace is a football, rugby and athletics stadium in Phokeng near Rustenburg, South Africa. It was built and is managed by the Royal Bafokeng Nation. It is used as the home stadium for Premier Soccer League club Platinum Stars. The Leopards rugby team host large attendance matches during the Currie Cup at the stadium, instead of their usual home ground, Olën Park. The capacity of the stadium was increased from 38,000 to 42,000 to be able to host five first round matches and one second round match at the 2010 FIFA World Cup. For the 2010 tournament, the main west stand was upgraded and enlarged and given a new cantilever roof. Other improvements include the installation of new electronic scoreboards, new seats, and the upgrading of the floodlights and public address system. The stadium upgrade was completed in March 2009 for hosting 4 matches of the 2009 FIFA Confederations Cup. Royal Bafokeng Stadium was one of the host venues for the 2009 FIFA Confederations Cup. In the World Cup, the stadium hosted five first round matches and one second round match and was the second smallest stadium for the tournament. Royal Bafokeng Stadium served as one of the host venues for the 2013 Africa Cup of Nations. ^ "Royal Bafokeng Stadium". Stuff. Retrieved 19 April 2018. ^ "Sports Palace | Royal Bafokeng Nation". Bafokeng.com. Retrieved 18 May 2010. 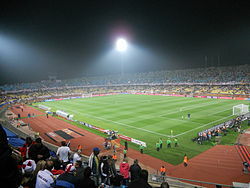 ^ "Royal Bafokeng Stadium: 2010 Venue – Sportslens". soccerlens.com. 4 December 2009. Retrieved 19 April 2018. ^ FIFA.com. "FIFA Confederations Cup Russia 2017 - Destination - FIFA". FIFA. Retrieved 19 April 2018. The parenthesis after each stadium, show how often it was picked as the team's home venue, according to the PSL website. This page was last edited on 19 January 2019, at 01:15 (UTC).